Subsequent to learning that lesson, I realized that “evil” interests committing global genocides are theologically bound to their doctrine that requires popular choice in support of their quasi-revealed (adequately concealed) agendas. Think about it this way. 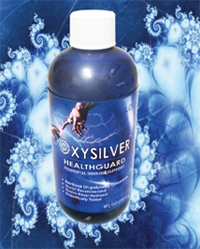 If you were Satan, very jealous of the Creator, to claim victory over God and civilization you would need to persuade people to follow you; choose evil over good; choose degeneration and chaos over peace and order; choose terrorism and political enslavements over human freedoms; and choose poisonous drugs over natural medicine and faith healing. And those outcomes can only be achieved by “informed consent,” albeit the information given is generally “misinformation” strewn with omissions and misrepresentations of important facts. 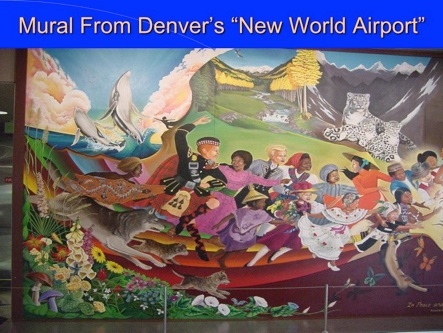 Accordingly, the murals beautifully depict the “bigger picture.” But as “art” it is subject to speculation and conspiracy theories. That controversy too lends strength to the evil administration, because of “plausible denialability.” It is public knowledge that plausible denialability is regularly abused by the CIA, for instance, to protect its covert interests. Agents are given information on a “need to know basis only,” securing compartmentalization of administration and the administration itself. 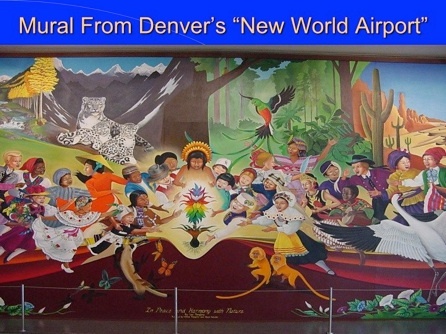 In these murals, genocide is represented to be associated with “New World Order” governance. 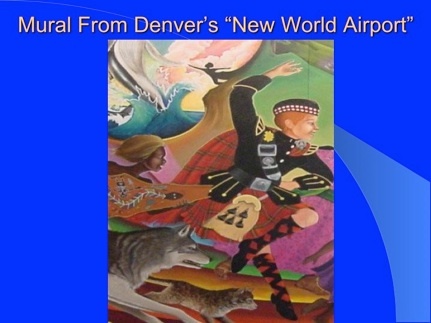 And who leads the dance in Taguma’s mural?–a Scottish Rite Freemason, begging the unanswered question, was this artist directed to include that imagery, and if not, why did he do so? 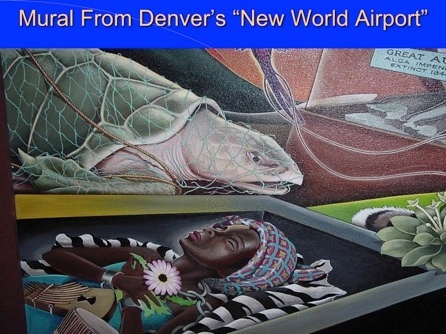 And that admission–a “selling out” of sorts–aids-and-abets the “Deep State” that administers the globalization and genocide depicted in Taguma’s murals. Fentress contributes to the problem, not the solution. Even the designer of the DIA chooses deadly silence, lives in denial, or doesn’t even see, how he contributes to the genocide depicted. 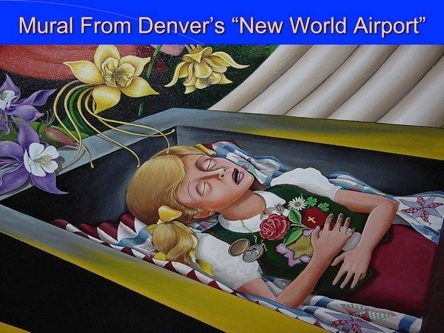 Here is a link to Colin St. John’s article confirming the secrecy and conspiracy first evidenced at length by this author (Horowitz) in Death in the Air: Globalism, Terrorism & Toxic Warfare. 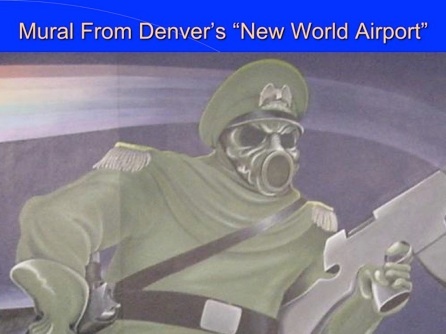 These images are found in Dr. Horowitz’s DVD entitled, Death in the Air: Globalism, Terrorism & Toxic Warfare, and his book by this same title. 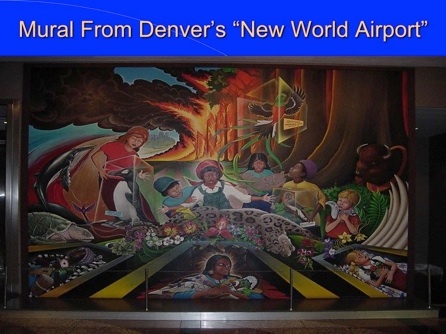 THE FOLLOWING ART SOURCES FROM DR. HOROWITZ’S PHOTOGRAPHY WITHIN THE DENVER “NEW WORLD AIRPORT” NOT LONG AFTER THE FACILITY OPENED IN 1994. 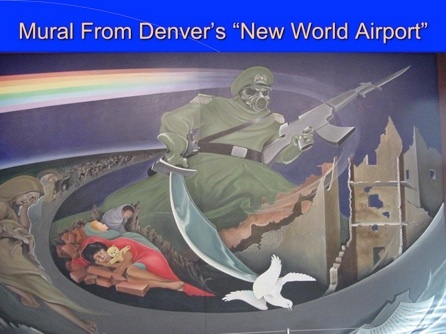 A gas-masked Nazi-alien stabs the dove of peace, a Christian symbol, with a Muslim sabre. The Nazi connection sources from IG Farben, the initial petrochemical cartel based in Germany, connected to the drug industry and the holocaust. The blade is swished through the air leaving a rainbow chemtrail polluting the air of the people below, suffering from the toxicity and genocide. 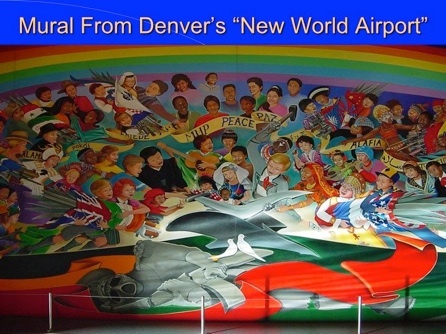 The children are closest to the sword (lower left) and a image much like the 911- twin towers destruction (lower right) is also depicted. Close-up of gas-masked Nazi alien. 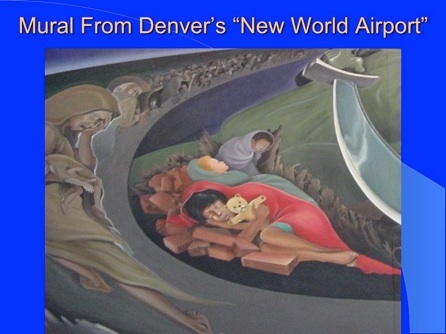 Against a backdrop of horrific destruction, and the extinction of various species, including whales and sea turtles, only children are seen in the center sobbing over three open caskets. The funeral service is for the Black African people on the left, the Native Red people in the center, and the White Judeo-Christians on the right. Close up of African woman in her coffin. 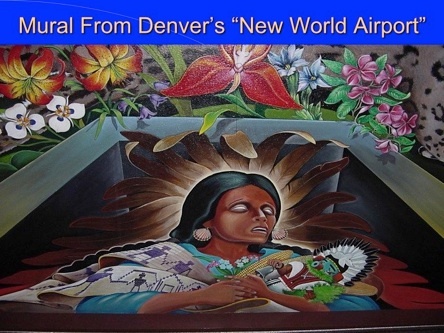 Native aboriginal groups are represented in the center casket. 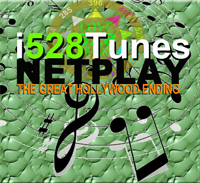 This Anglo-American woman, lying on and American quilt, hugs a Jewish star and Christian bible, divided by the red rose, symbolic of the Rosecrucians and the Illuminati. To the left of the rose is locket containing an image of the girls’s family. This indicates the termination of family traditions. 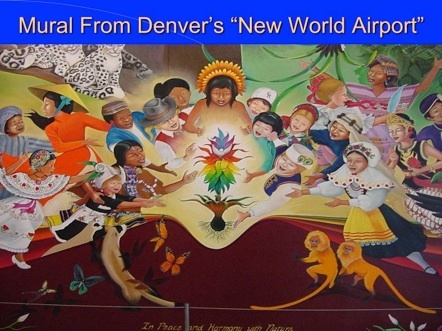 Notice also the flowers at the top left of the image is a Columbine blossom, suggestive of the Columbine massacre. Finally, the Nazi alien is vanquished. It lies dead in the foreground. A German lad strikes his Muslim saber, like an anvil, with his hammer–and image of facism and Communism. Notice there are not adults here. Only children are left to celebrate the New World Order. The Caucasian girl holds the rose, and a African baby doll next to the sword, as “peace” is celebrated by song and dance. Notice the dance line begins, and is directed, by the Scottish-Rite Freemason. 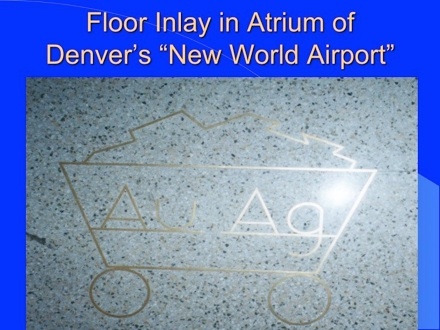 In the floor is a mining cart showing the symbols of silver and gold (Au and Ag, respectively).Au-Ag symbols also code for the “Australian Antigen.” This was the first name given to the hepatitis B vaccine virus. 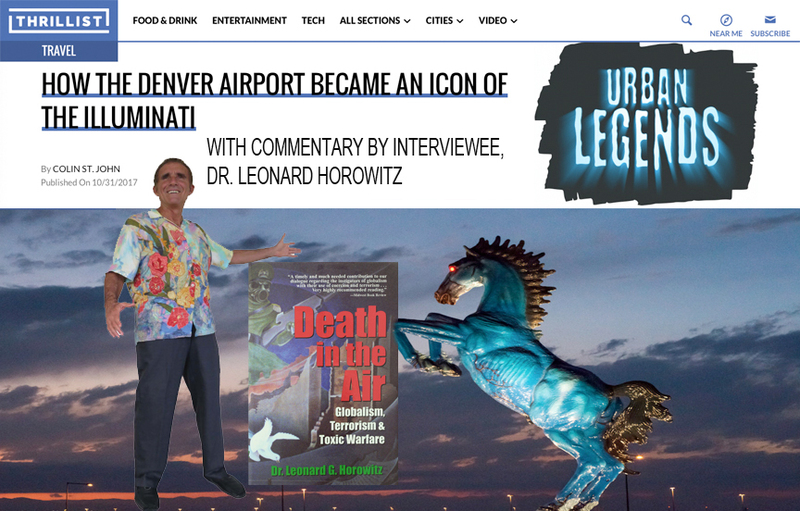 Dr. Horowitz’s book, Emerging Viruses: AIDS & Ebola–Nature, Accident or Intentional?, proves the hepatitis B vaccine was used to trigger the HIV/AIDS pandemic. 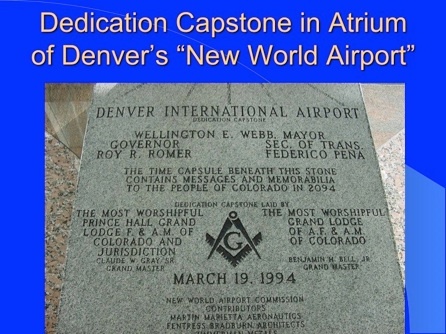 This dedication capstone at Denver International Airport heralds the Masonic symbol and “New World” designation. 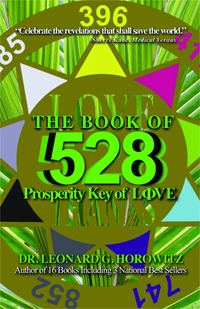 There are two separate Masonic lodges cited. They are segregated Black and White lodges.